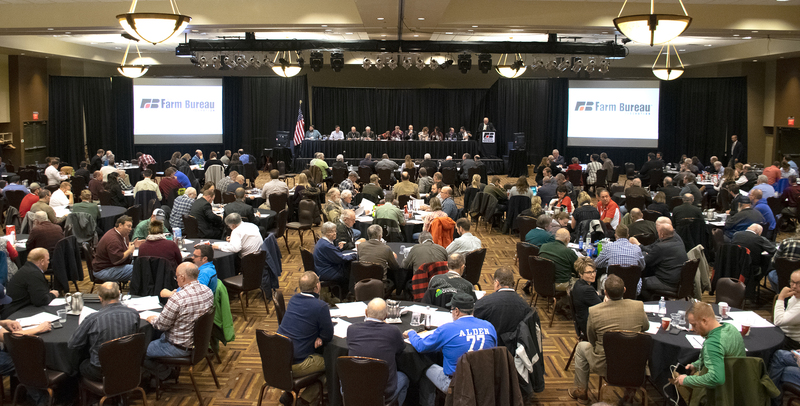 Today, more than 240 delegates at the Wisconsin Farm Bureau Federation’s 99th Annual Meeting in Wisconsin Dells established new policy directives for the organization. Farm Bureau delegates adopted the policies that will guide the legislative agenda for the state’s largest general farm organization in 2019. Resolutions were submitted by delegates as part of a grassroots policy development process. For more than an hour, delegates held a robust dairy policy discussion regarding supply management. Delegates were adamant that Farm Bureau should have a seat at the table to discuss all options for the dairy industry. Other adopted dairy policy included support for revising the federal Milk Marketing Order. Delegates supported a differentiation between lab-grown meat and milk versus conventionally produced agriculture products. They agreed that milk from mammals should be the only product eligible to use standardized dairy labeling terms. Farmers wanted clarity on federally-defined terms such as organic versus non-federally defined terms such as natural and GMO-free. Requiring farm milk inspectors to provide consistent interpretations of regulations during inspections. Removing the wildlife damage payment cap. Better tracking and studying for relocated bear movement. The DNR to create subzones to better control overpopulated wildlife in small areas. Limiting use of the term blighted for productive farmland through eminent domain. Improving mental health resources for farmers. Transferring CAFO permitting from DNR to DACTP. More recycling of ag plastics. The right of farmers to be able to obtain necessary software and equipment to maintain their equipment. USDA to equip bear traps with electronic monitor systems. Standardization when it comes to food expiration terms, such as: sell by, best by, use by. The federal resolutions will be forwarded to the American Farm Bureau Federation for consideration at its annual convention next month.